connections to the alt-right Steven Pinker. 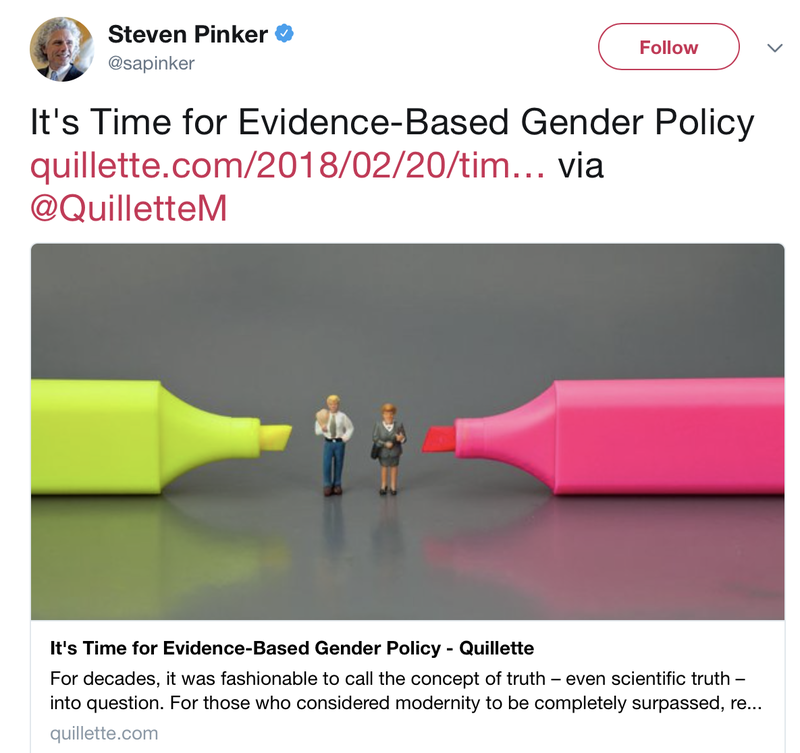 I spoke too soon when I mentioned Steven Pinker hasn't tweeted a recommendation for anything in Quillette since January 31 - he just recommended the article I discussed in my previous Pinker post. You can't tell Pinker and his fanboys that evolutionary psychology is not the same as evidence because they are True Believers and it bothers them not at all that their theories based on strict adaptationist speculations are untestable. They just explain their theories about lady brains, declare victory and then try to make social policy based on this assumed victory. Speaking of which back to "Better Angels." ...I first learned of the decline of violence from Martin Daly and Margo Wilson’s classic book in evolutionary psychology, Homicide , in which they examined the high rates of violent death in nonstate societies and the decline in homicide from the Middle Ages to the present. today, but rather that this is an expression of a ‘young male syndrome’ that exists because that was the case in the evolutionary history of human violence, a point echoed by Wright (1994: 262). Maschner and Maschner (1998: 22–3) follow Daly and Wilson, and repeatedly cite Chagnon (1988), to claim that all war is driven by reproductively-oriented status striving by ‘males between the ages of approximately 15 and 25–30’. Chagnon’s statistics contradict this idea. A maximum of 6 per cent, and as noted earlier possibly none, of the men in his sample of between 20 and 24 years old had participated in a homicide, and only 12 per cent of the combined categories for 20–30 years old had done so, whereas 62 per cent of the men over 40 were unokai. Chagnon also tells us (1968a: 115, 129–30) that young men are likely to avoid physical confrontations, desert raiding parties, and be reluctant to attack at the last minute. On a raid, young men are kept from the most danger by older men, and are allowed to retreat first. Among the Yanomami, the chosen exemplar of our evolutionary past, killers are (by local standards) middle-aged married men. You can read the whole thing for yourself here. It's 17 pages and well worth it. I have discovered since my last post that Pinker doesn't only use "idealist" (called "cultural" in the Ferguson paper) and sociobiological ("biological" per Ferguson) research strategies but he also uses cultural materialist ones. Pinker adopts "infrastructural determinism" straight out of cultural materialism in order to explain something he calls "the Civilizing Process" except he uses the term "exogenous triggers." In the case of lessening European violence he identifies the triggers as "Leviathan" and commerce. The Leviathan , a state and judiciary with a monopoly on the legitimate use of force, can defuse the temptation of exploitative attack, inhibit the impulse for revenge, and circumvent the self-serving biases that make all parties believe they are on the side of the angels. Commerce is a positive-sum game in which everybody can win; as technological progress allows the exchange of goods and ideas over longer distances and among larger groups of trading partners, other people become more valuable alive than dead, and they are less likely to become targets of demonization and dehumanization. In Europe, the caste system was swamped by the development of entrepreneurial contracts, the bourgeoisie's challenge to hereditary privileges, and the breakthrough to capitalism. Harris then goes on to contrast European feudalism with Indian socioeconomics, which increases the clarity of Harris's explanations of infrastructural determinism. But then Harris is a serious scholar. The scope of Pinker’s attentions is almost entirely confined to Western Europe. There is little discussion in “The Better Angels of Our Nature” about trends in violence in Asia or Africa or South America. Indeed, even the United States poses difficulties for him. Before I get into Pinker's difficulties with the United States I want to share Marvin Harris's thoughts on research strategies. Science does not set out from a concern with what sometimes happens; science sets out from a concern with what generally happens. Cultural materialism asserts that infrastructure generally determines structure and superstructure. Eclecticism consists of the refusal to state what generally determines what. Therefore it cannot organize the collection of data around the task of testing what can generally be expected to account for sociocultural difference and similarities…. Then, as if he had Pinker in mind, Harris gives an example of someone who starts out with infrastructural determinism and then switches out. Which is what Pinker does and we will look at that next.